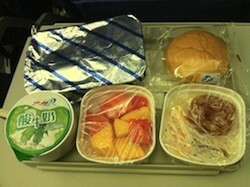 Over 20 passengers on an Air China flight were sick after eating expired beef pancakes on a domestic flight to Beijing. One passenger shared a photo of the out-of-date food on Chinese social network Weibo showing the expiration date of October 2, four days before her flight. An official statement by the airline claimed that incorrect packaging was to blame for the “misunderstanding,” and that any leftover or expired food is regularly discarded. The passenger claimed that flight attendants refused to acknowledge the issue or warn anyone eating the bad meals. Food poisoning is fortunately rare on airlines, but it does happen. Earlier this summer, Delta passengers on an Istanbul-New York flight suffered possible food poisoning and were met by medics on arrival at JFK. A Miami family sued American Airlines in 2011 after a man died allegedly due to food poisoning on a flight from Barcelona. Read our advice on dealing with food poisoning while traveling, in the air or on the ground. The more frequently I travel, the more I stress about having enough time to prepare to be away from home for a week or two, and avoid coming home to a refrigerator full of rotten food or leaving a sink full of dishes. Through trial and error, I’ve discovered the best food to cook before a vacation is a simple roast chicken (sorry, vegetarians). The Department of Health suggests you can keep cooked chicken in the fridge 3-4 days, while I’d say you are good for up to a week, but you don’t want to take a chance on getting food poisoning before you leave on a trip. So let’s say four days to be safe. Now, how to minimize your cooking and cleaning time, and mix it up so you aren’t eating the same leftovers every night? Let’s say you are leaving on Friday: here’s your timeline. Depending on your preferences, you can use the chicken to top a salad (use more of that kale!) or on some pasta with some store-bought sauce (put leftover sauce in a freezer container for later use). Try to strip the chicken of meat so you can wash out the roasting pan, but keep the carcass and bones. Take that leftover carcass and simmer in water to make broth. You won’t need it tonight, so you can do after work and refrigerate before you go to bed. Use up a loaf of bread and make sandwiches, maybe melt some cheese on them if you have anything open and are feeling fancy. Make kale chips with a little olive oil and salt (I like to use garlic salt); line the baking sheet with foil so you have less to wash. If you have a slow cooker, you could put it on in the morning set on low for the day, but you can throw together chicken soup at dinnertime too. Strain the broth you made last night, add the leftover chicken bits, and toss in any remaining vegetables (goodbye kale!) and grains from the first night. A can of beans is a good addition too; fiber is important before traveling! Any left? Put it in the freezer for an easy meal post-vacation. Sick of chicken (or don’t want to be sick from chicken)? Play it safe and order something in that doesn’t require many dishes, like pizza or noodles (sushi is always a gamble before a trip, but a good light option). Try to keep it a little healthy and make/order a side salad. Pack, take out your trash, and finish doing dishes. Leave on your trip, feeling good that you didn’t waste any food, and you ate a heck of a lot of kale. Eat anything other than chicken. In a recent tragedy, two Canadian sisters were found dead in their hotel room on the Phi Phi Islands in Thailand. Discovered on June 15 by the Phi Phi Palm Residence Hotel’s maid, Audrey and Noemi Belanger, 20 and 26, are suspected to have died from severe food poisoning, most likely from blowfish or poisonous mushrooms. While officials did not find any signs of foul play, they did notice various over-the-counter drugs like ibuprofen, which can have serious effects on the stomach. Moreover, blowfish, which is extremely toxic if not prepared correctly, can cause death within an hour and a half of eating. In fact, blowfish poison is about 100 times more lethal than potassium cyanide. At this time, the bodies are undergoing post-mortem examinations in Bangkok to check for traces of poisonous substances. Poisonous alcohol has been blamed for the deaths of three Russians on a cruise off the Turkish resort of Bodrum. The Russians were part of a trip by travel agency managers exploring tourism possibilities in Turkey. In total, 20 Russians and one Turk were poisoned by the drinks. The $50 cruise included 10-12 mixed drinks. While some reported that the alcohol had a strange taste, it appears that didn’t stop them from drinking it. Initial reports suggest methanol was added to the booze. 1. Be wary of alcohol in Muslim countries. I’m sorry if this offends any legitimate Muslim brewers or vintners out there, but the fact of the matter is that much of the alcohol produced in Muslim nations is substandard, and apparently in this case downright dangerous. A culture that frowns on drinking pushes drinking underground. This lowers standards both for producers and consumers. Also, consumers are less likely to know what’s good and what isn’t. I’ve traveled all around the Muslim world and have seen a lot of dodgy booze. 2. If it tastes strange, don’t swallow. This is standard travel health practice. One of my worst cases of food poisoning happened in India. It was a hot day and I bought a local brand of cola. I took a big slug of it and swallowed, only to wince at an acrid, industrial chemical taste. I spit out what remained in my mouth but it was too late. Within an hour my gut felt like I’d swallowed a dozen razor blades. I learned my lesson: taste first. 3. Don’t overdrink. The cruise included ten to twelve mixed drinks? That’s poison even if the booze is normal. Overdrinking overseas (or even in the wrong bar back home) can make you ill, get you robbed, or worse. Drink sensibly. You’ll enjoy your vacation more.